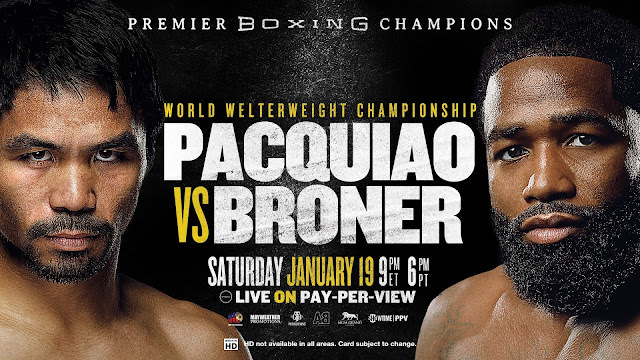 Watch the WBA World Welterweight championship between the Filipino Champion Manny Pacquiao and the American Challenger Adrien Broner. Fight scheduled at the MGM Grand, Las Vegas, Nevada, USA on January 19, 2019. 8th division world champion Manny Pacquiao is a 40 years old from General Santos City, Cotabato del Sur, Philippines. He is world rated no. 4 in the welterweight division and has a record of 60W-7L-2-39KO's. AKA "Pacman" is coming off a 7th round TKO win over Lucas Martin Matthysse last July 2018. On the other hand, four weight divison world champion Adrien Broner is a 29 years old from Cincinnati, Ohio, USA. He is world rated no. 12th in the welterweight division and has a record of 33W-3L-1D-24KO's. AKA "The Problem" is coming off a majority draw contest over Jessie Vargas last April 2018.